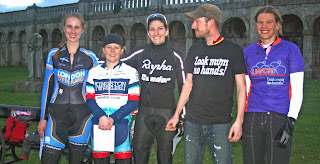 Last night's Crystal Palace races saw 21 women on the start line, and some great racing on the twisty, fun park circuit. Elise Sherwell won the AnaNichoola prize by retaining her league-leading position after coming in 4th place, in a race which saw a very close sprint finish from the lead women coinciding with the men's 3/4 group crossing the line. 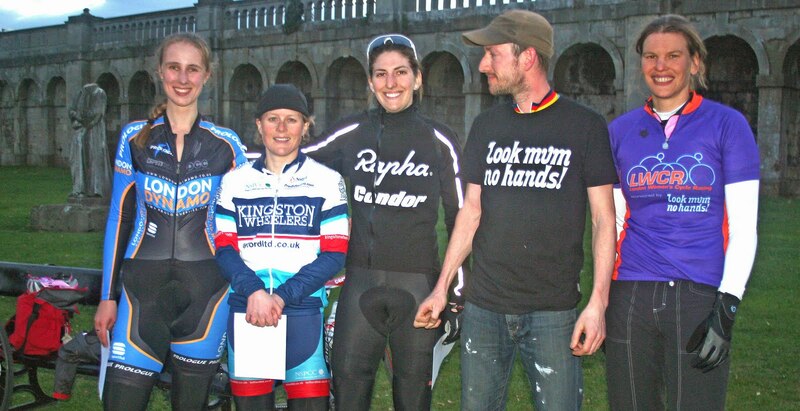 Our picture, courtesy of LondonCycleSport, shows from left-to-right: London Dynamo's Emma Patterson, who came third on the night; race winner Maryka Sennema from Kingston Wheelers; second place Clare Beaumont of Rapha Condor; Lewin Chalkley from league sponsors look mum no hands! ; and Pearson's Elise Sherwell in the LWCR leader's jersey. Full results, updated rankings and a race report to follow soon.